'Manchurian' is an Indian Chinese cuisine. Indian Chinese cuisine is the adaptation of Chinese seasoning and cooking techniques to Indian tastes. The Indian Chinese cuisine is said to have been developed by the small Chinese community that has lived in Kolkata (formerly Calcutta) for over a century. Today, the Chinese food has become an integral part of the Indian culinary scene. It is also enjoyed by Indian and Chinese communities in Malaysia, Singapore and North America. In a bowl add all purpose flour, corn flour, soya sauce, salt, sugar and water and mix well as semi thick slurry. 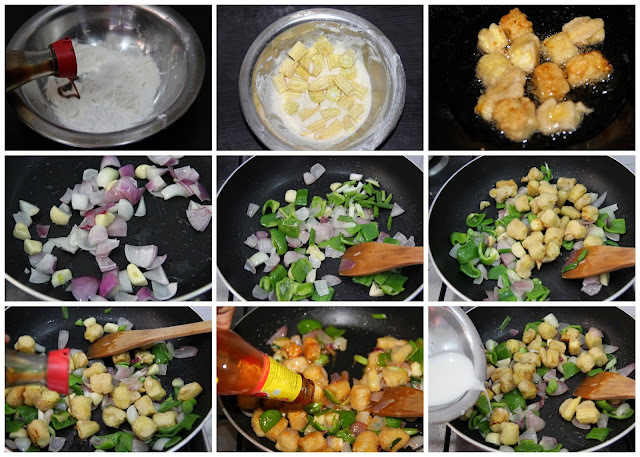 Take the baby corn pieces, dip well into the batter and deep fry till slight golden colour. In a pan add oil, onions, garlic, green chillies and half cook them. Then add capsicum, spring onion and cook lightly to ensure the green colour of the capsicum doesn’t change. Add soya sauce, salt and sugar to balance the taste. Add tomato sauce 1 teaspoon if you like. At last add the corn flour slurry and allow the gravy to become thick. Note: If you want this dish as Gravy add more soya sauce, green chillies, salt sugar and balance the taste. Then add more corn flour slurry and when the gravy thickens put off the gas. Looks so delicious and tasty.Nice click. nice one friend.wats special dish for new year? Awesome manchurian..one of my favorites. 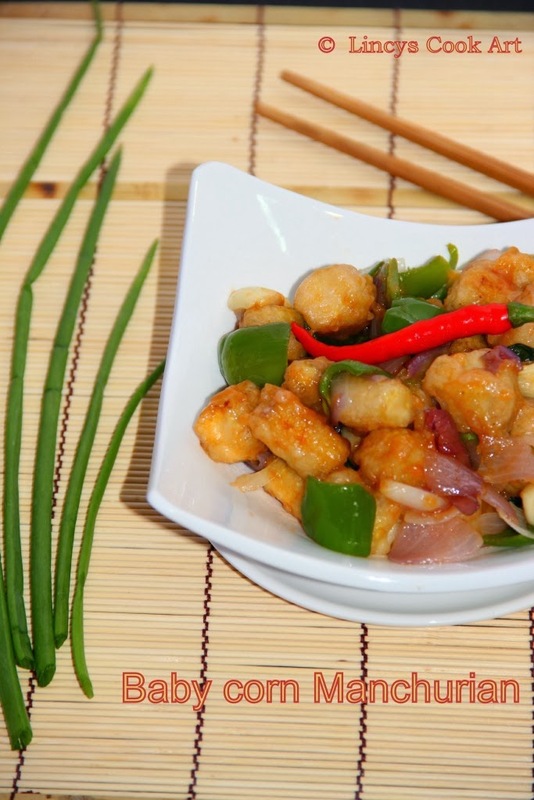 Delicious conr manchurian, thanks for sharing with favorite recipes; Christmas recipes event.